Waking up to an alarm clock is a much-loathed and just generally unpleasant experience. 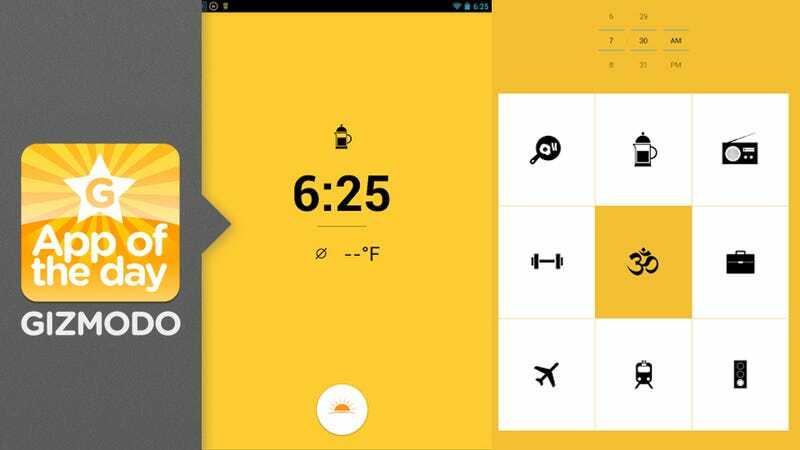 But Warmly for Android wants to help you start the day off right—and hungry. Let's you pick from a variety of mostly wonderful, friendly sounds to wake up to. Options include things like bacon, brewing coffee, or if you hate either yourself or your loved one next to you, an airport. Over the course of 2-3 minutes, the volume of your selected sound gradually increases, making it so you don't jolt awake. It'll even give you a short preview of the weather before you head out to start your day. Other alarms raise the volume incrementally over a period of time, but this can easily result in you ignoring the alarm altogether. Warmly, though, breaks up its loudest point with a somewhat louder bell. You're body's been slowly waking, so it's not as alarming as it would be otherwise, but you will still definitely hear that it's time to get up. This simulates a far more natural waking up experience and will likely leave you feeling far more perky once you pop out of bed. There's also a wide variety of morning-themed sounds, so once you start to despise one for its hand in ending your slumber, you can move on to the next with plenty left still.